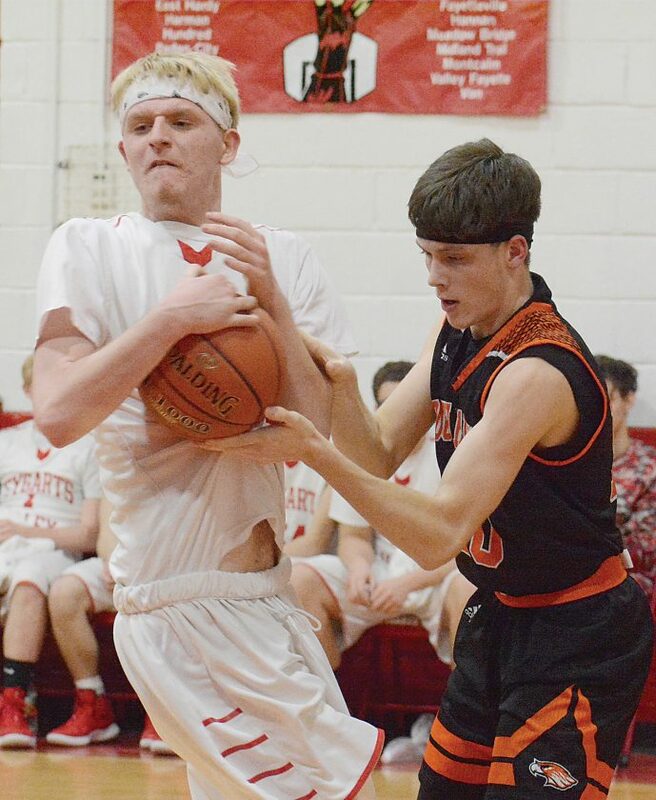 The Inter-Mountain photo by Joey Kittle Tygarts Valley’s Jacob Taylor, left, battles South Harrison’s Thomas Sears for a loose ball during Tuesday night’s contest in Mill Creek. The Bulldogs dropped a 56-49 verdict to the Hawks. MILL CREEK – South Harrison scored the game’s final seven points to get past a determined Tygarts Valley squad, 56-49, Tuesday night in Mason-Dixon Conference action. The Bulldogs never trailed in the game until the Hawks (10-2) went on a 7-0 run over the final 3:00 of regulation. 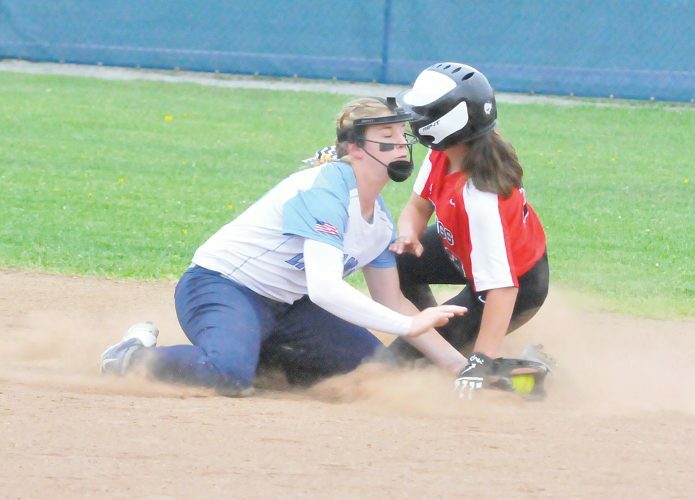 “Our kids played hard and gave it their all,” Tygarts Valley coach Tom Wamsley said. “We just couldn’t get a big shot or stop down the stretch. After leading 20-15 after the first quarter, the Bulldogs were able to take a six-point advantage, at 32-26, into the intermission after getting a basket by Logan George and a 3-pointer from Josh Bright to end the first half. South Harrison cut the deficit to 43-42 after three quarters. George netted 17 points and Bright and Aidan Row contributed nine apiece for Tygarts Valley. Caleb Jenkins fired in a game-high 23 points and Brett Barnette added 14 for the Hawks. 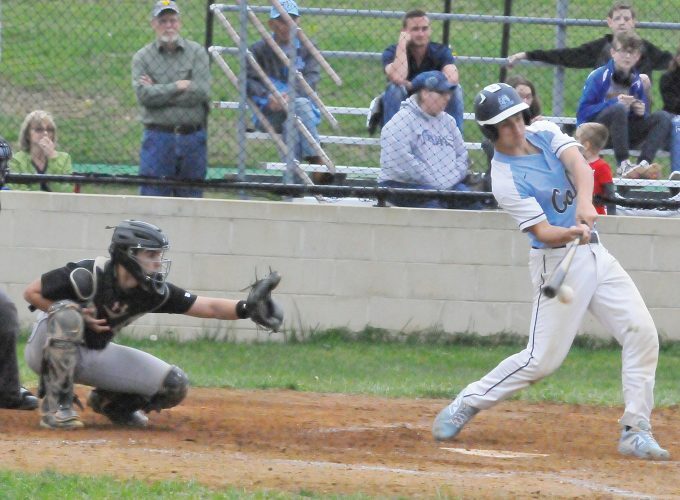 Tygarts Valley (6-7) will return to action at 7:30 p.m. Friday at St. Marys in the second round of the WVHIT.